This immense area of sheltered water has been paddled for years by the touring kayaker. The Wilderness Waterway is a 99 mile paddle-way through some of the most pristine waters in North America. The National Park maintains beach, island and "chickee" campsites throughout the Park on your journey, yet, the Kayak Fisherman has just recently begun to discover this rich fishery … very recently. 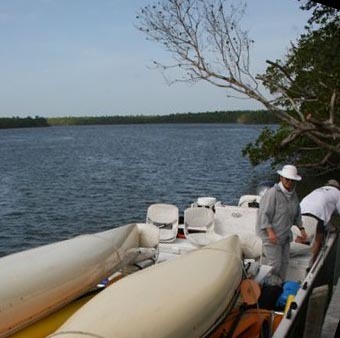 The fishing in and around Everglades City and Chokoloskee Island is a wonderful year-round, sheltered fishery. There is a lifetime of fishing just a short paddle from shore. You really do not have to go anywhere else. However, staying put is not in our nature; kayak fishermen are explorers and adventurers at heart. The Everglades National Park is huge and the local area is just small part of this wonderful place. Exploration requires a lot time and lot of paddling. The Wilderness Waterway, alone, is a minimum seven day paddle, without stopping to fish. There are launches in Chokoloskee, Everglades City and Flamingo (on the East side), but nothing in between. You must do a "loop". Many of these loops have exceptional fishing opportunities, but simply, there is much more. The "more" is why we created the Mother Ship, the Yak Attack. On this dedicate kayak transport boat, we transport six anglers, kayaks, all our fishing gear and tackle into the core of the Park. We fish areas that literally would take days of paddling just to get to. After reaching our destination, we typically set up "base" on a remote island beach. From there we unload, get ready and fan out to fish until it time for lunch back at the beach. After lunch, we fish again for several hours before loading up to head back in time for dinner at a local restaurant. Spending lots of your time and energy paddling is not part of a Yak Attack trip. The Yak Attacks have really "opened up" the Park to the average kayak fisherman … opened up areas that we could never get to before. 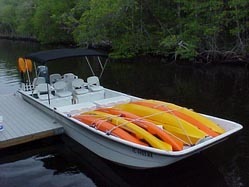 It started simply enough with a 24 ft center console with kayaks strapped across the bow and stern. This worked pretty well, but there were limitations … basically you could not see out of the boat!! 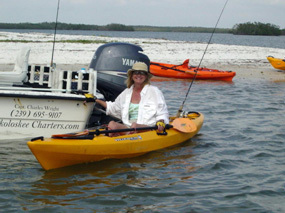 This area is shallow and like most of Florida, our kayak fishing is mostly horizontal…not vertical. This original boat drafted too much water to access many of the areas that we wanted get to. We tried several combinations of systems on flats skiff, some actually worked out very well. We still do some specialty trips with these boats. But, in general, these did not fit the bill. Back to the drawing board … We needed something that could carry six anglers and their gear … three rods each, tackle boxes, paddles, PFD's, anchors, lunch, drinks and at least one captain and a guide. It had to be fast enough to "get there" and not waste valuable fishing time. It had to run shallow enough to get us close to the beaches and remote interior saltwater lakes and bays. It had to carry enough fuel make at least three trips … our typical long weekend booking. Further, the kayaks had to be easy to load and unload from the boat into the water. Equally as important, she had to make it easy for the angler to get into and out of their kayaks and into the transport boat. In the boat, anglers needed to be comfortable and be able to see very well. For some the boat ride through this area is as much a part of the trip as anything. It is a tall task for just one boat. While not perfect, what we came up with is very close. She is 27' long and drafts only 13" full loaded yet can travel safely nearly 40 mph. Outfitted with a 150 hp four-stroke, she is as quiet, fuel efficient and as ecologically friendly as possible with today's technology. Fitted with an electric jack plate, she can idle around with basically "zero" engine draft to avoid disturbing our precious grass beds and oyster systems. With 78 gallons of fuel she has a range of over 300 miles. The kayaks selected were Heritage Redfish 12s. They ride in a welded aluminum rack in the first half of the boat. Lying securely on thier sides in the rack, anglers and guests have an unrestricted view of the landscape during the ride. A center path provides a place to load and unload the kayaks to and from the water. The entire rack system, with the six kayaks loaded in place, can be removed from the boat at dockside with a simple winch system. When they are loaded in the rack, all the kayaks can be locked securely in place thru the scupper holes … a bit of extra piece of mind. The anglers' area has six, removable cushioned seats, four of which are mounted on to two, five-day "super" coolers. Two more of these coolers are on board for a total of four. One is used for as cooler for lunch and drinks; the second as a dry box for anglers personal gear; the third hold the kayak PFDs; and the forth holds the dry bags and gear for each of the six kayaks (rod holders, anchors, etc.). A bimini top provides shade from the sun while at idle or on a 40 mile per hour plane. Some of the places we access do not have a beach and we must do a "water launch". 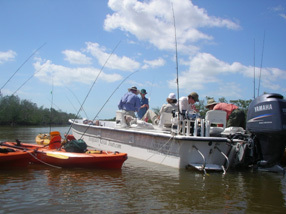 Here the anglers get into and out of the kayaks directly from the boat. A "sports" ladder mounted on the side of the boat makes this a "piece of cake".